Fender Jaguar Model Solid Body Electric Guitar (1966), made in Fullerton, California, serial # L84502, Olympic White lacquer finish, alder body, maple neck with rosewood fingerboard, original black tolex hard shell case. This beautiful early-CBS-era Custom Color Jaguar shows only some light wear for its 50+ years on the planet and remains in superb playing condition. 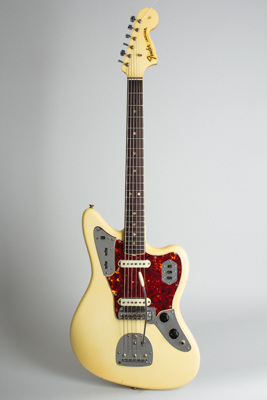 The instrument was the top-of-the-line Fender guitar available in 1965-6...a Jaguar finished in Olympic White, one of the more popular 1960s Custom colors. This guitar was built just about two years after the Fender sell-out to CBS in January 1965, and is only subtly changed from a Pre-CBS example. The stamped neck date on this guitar is FEB 66 and the pots date to the 30th week of '65. The typical late '65-early '66 features include a bound fingerboard with pearloid dot inlay (recently changed from the unbound "clay" dot style) but still the old style lacquer finish on the body and matching headstock. Other features include the gold transition logo headstock decal, newer "F" housing tuners, and pickguard made of ABS plastic instead of the nitrocellulose used earlier. Even having undergone a revival of sorts in recent years, the Jaguar remains a somewhat under-appreciated guitar with several interesting features. The scale length is shorter than other professional-grade Fender guitars at 24", a feature designed to enhance playability. The twin-circuit wiring and floating vibrato are shared with the Jaguar's ancestor the Jazzmaster, but the guitar actually feels and sounds quite different. The unique Jaguar pickups with the metal "claw" baseplate are optimized for clarity and crispness, factors that led to the guitar losing popularity in the late '60s as twang went out and distortion and crunch came in! Nevertheless, this was the top-of-the line '60s Fender and a very high quality guitar. With its white-turning-to-cream finish and chrome accents, this is a real hot rod -- one of the coolest and classiest Jaguars we have had. This is a super clean guitar overall, all original with no repairs or alterations. The finish has some small dings and chips, mostly near the edges and painted headstock face edge. The fingerboard has some very light divoting in the lower positions, but the original frets do not show much wear. While this beautiful Jag shows some signs of use, whoever played this guitar took very good care of it. The original mute foam is still present -- ossified into a solid black mass but can easily be removed (or replaced) as desired. This is a really great-sounding guitar and everyone around the shop thinks it's the best-sounding Fender "rhythm circuit" we've ever heard; deep and rich almost in humbucker land. Overall a lovely example, still resplendent in its original no-logo, red-lined black Tolex case. Excellent + Condition.